For every 250,000 injury-free hours worked, our operations can earn $5,000 to donate to a local charity. Last year, the Thunder Bay pulp and paper mill banked a total of 750,000 injury-free hours. It was an impressive achievement that translated into $15,000 donated to local charities. In 2014, the Board of Directors Safety Awards across all of Resolute’s operations were accompanied by a total of C$280,000 in donations to charities chosen by mill employees. 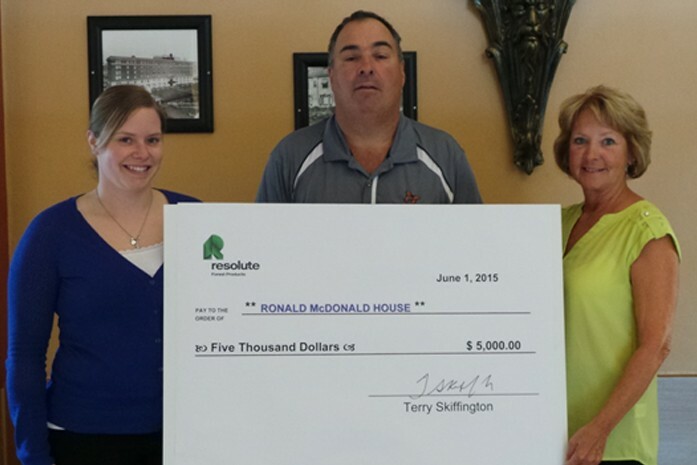 Photo: Resolute JHSC member Ashleigh Marchl (left) and co-chair Alex Cryderman (centre) present their donation to Janice Beebe, chairman of the Ronald McDonald House Charity Golf Tournament.